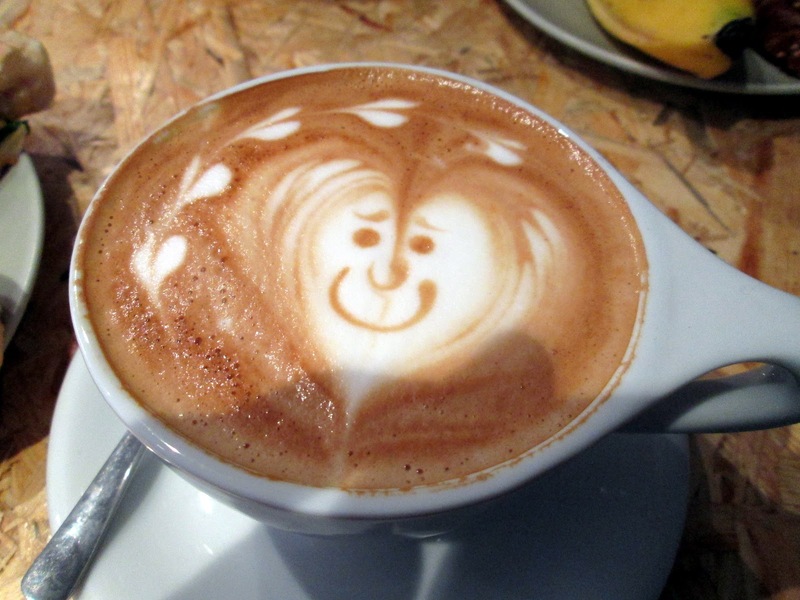 My November 9 blog for Baptist News Global is posted on their website here. Tomorrow morning I’m going to slip a clerical robe over my shoulders and drape a green liturgical stole around my neck. I will line up behind the choir, along with the other pastors and liturgists, process up an impossibly long center aisle in a neo-Gothic sanctuary and take my assigned seat in the divided chancel. Later in worship I’ll climb a circular set of stairs into a pulpit as high as Rapunzel’s tower. I’m crazy about this new adventure because, for one thing, it’s grounding me in the reality that the gospel is true and transformative in every culture—including worship cultures. The heart of God beats in country churches and cathedrals, in darkened theaters and beachside pavilions. The Spirit of Christ is at home among hand-clappers and genuflectors; the Good News sings through guitar amps and organ pipes. I also love this moment because it offers me a chance to experience again the childlike delight and curiosity of a beginner’s mind. Nothing blocks the spiritual path like the assumption that we already know, or that we have nothing more to learn. Yesterday one of the other pastors at our church kindly led me through the considerable choreography of a worship service at First Baptist Church of Washington DC. My awkwardness reminded me of the ballroom dance lessons Tim and I took years ago: “Step here…turn here…cross the floor and pause.” I imagine there’ll be some missteps tomorrow, but what fun it is to learn! Good and gracious God, let me find you in all people and things…and be found by you in every moment. That is enough. I come from church-goers on my mother’s side. (I also come from hell-raisers and Alabama moonshiners on my father’s side, but that’s a different devotional.) For years my great grandmother, Lucy Modenia Spanagel, was a pillar of the Mt. Vernon Methodist Church in Birmingham. 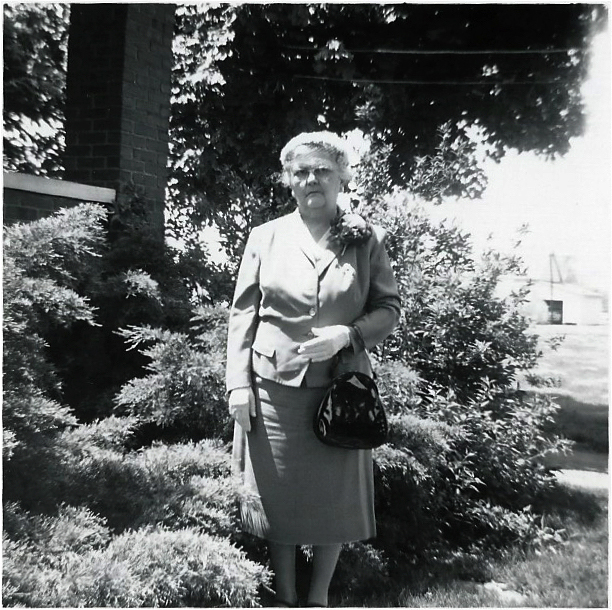 In most of the old photos of Grandma Lucy, she’s wearing a simple housedress and apron—her “everyday” clothes. But a few pictures show her dressed to the nines with white cotton gloves and a fancy hat—her “church” clothes. 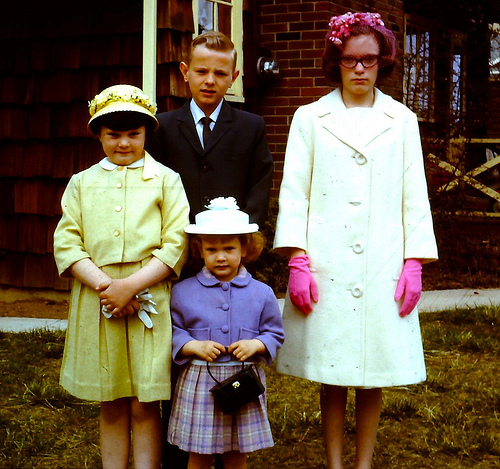 For Grandma Lucy, as for many from her generation, the practice of wearing Sunday Best to worship arose from a genuine desire to honor the Lord. Everything inside me? Seriously, everything? This flies in the face of the sacred Southern aphorism: “We may think it, but we do not speak it!” But what if “speaking it” is the very thing God desires most from us? Not the endless (and futile) polishing up of our shiny selves, but the offering up of our whole selves. The discipline of the heart makes us stand in the presence of God with all we have and are: our fears and anxieties, our guilt and shame, our sexual fantasies, our greed and anger, our joys, successes, aspirations and hopes, our reflections, dreams and mental wandering, and most of all our people, family, friends and enemies, in short all that makes us who we are…. We tend to present to God only those parts of ourselves with which we feel relatively comfortable and which we think will evoke a positive response. Thus our prayer becomes very selective and narrow. And not just our prayer but also our self-knowledge because by behaving as strangers before God we become strangers to ourselves. Who can say where God lands in the “white gloves vs. flip-flops” debate in worship? As with most things that really matter to God, I imagine it comes down to the heart—and not just our Sunday heart. Our whole, real, raw, angry, anxious, unpolished heart. This is the best offering of all. Seventy-five miles north of Santa Fe there’s a high desert canyon so ancient, so primordial, I half-expected to see pterodactyls in the sky instead of hawks as I steered my rental car along 13 miles of single-lane dirt road. The road runs along the Chama River where elk graze along the banks, and beavers big as bear cubs drag sticks from the woods to their dams in the greenish water. At the end of the road is the Monastery of Christ in the Desert, where some 25 Benedictine monks from a dozen countries around the world share their lives with one another, and with the guests who come throughout the year to pray and work alongside them. Hospitality is embedded deep in Benedictine practice. The robed, sandal-shod brothers gather in a beautiful adobe chapel seven times a day for prayer, starting with Vigils at 4:00 a.m. and ending with Compline each evening at 7:30. They pray the Psalms, all 150, over the course of each week, then start over again. They sing all the psalms, even the “cursing” ones that call down the whole gamut of affliction on the heads of the psalmist’s enemies. I can report that Happy is the one who takes your babies and smashes them against the rocks feels perhaps a wee bit less appalling when set to Gregorian Chant. The monks not only pray; they also labor four hours a day and invite their guests to join them. My assignment the first day was pulling weeds in the cemetery with Brother Will from Atlanta and hauling rocks in a wheelbarrow with Brother John Baptist from Malawi. Other guests worked in the hops field. The monks brew and sell their own beer, called Monk’s Ale. “Brewed with care and prayer” it says on the label. I came to the Monsatery a week before their 50th anniversary celebration. In the gift shop I bought a history of the community, commissioned for the occasion. 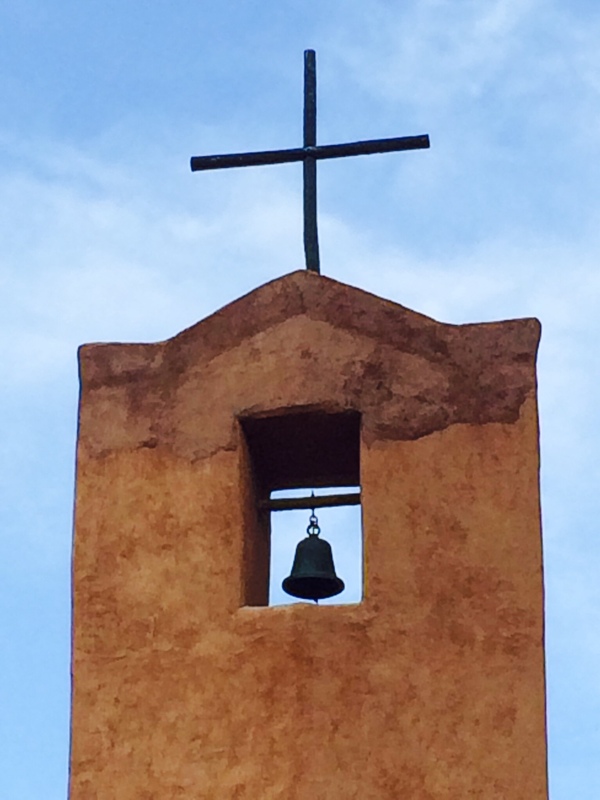 The monastery got its start in 1964 when an intrepid Benedictine monk named Father Aelred from Rhode Island stumbled upon the remote canyon by happenstance and was hooked. He and two close monk buddies from New York set up three tiny tents on the banks of the Chama and made a go of it. In the face of blizzards, floods, land disputes, wild animals and near-fatal injuries, they carved out a primitive observance of monastic life in the tradition of John the Baptist. Fast-forward eight years to 1972. The monastery has grown! From three monks to four. However, relationships between them have deteriorated to the point that Father Aelred and his one-time best friend, Father Gregory, are no longer speaking. They communicate now with each other only through notes passed to the other two monks. Things continue to go downhill until one day Father Aelred asks the groundskeeper to drive him to Santa Fe. Without a word to his three brothers he catches a bus out of town. They never see him again. There’s a grace note at the end of this jangling story. Because the Spirit of God works just fine in spite of human silliness, the Monastery is a beautiful, thriving community today. I’m sure squabbles still flare up over this or that. But love pings around the place like a pinball and bounces off the red canyon walls. And every night, as the monks wrap up their prayers, their liturgy includes mention of “our beloved founder, Father Aelred,” making no reference to his defection forty years ago. Instead, they bless his memory and thank God for all the gifts that have come since. 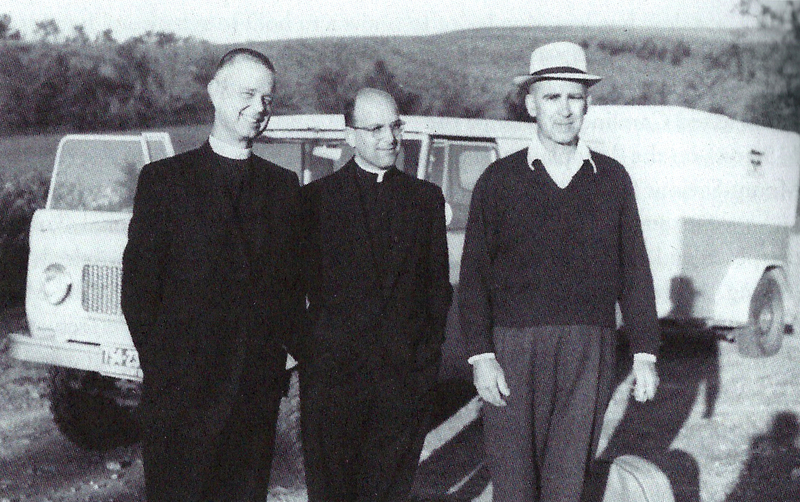 Father Aelred (left), Father Basil, and Father Placid en route to the Chama Canyon, circa 1964. This piece originally appeared September 4, 2014 at http://www.abpnews.com. Today I visited with Tad. He and his partner, Rob, have been part of our church for about a year now. Tad and Rob sometimes hold hands in worship, which sends some people into complete apoplexy, I know. But today I didn’t want to talk about any of that. Today I wanted to know Tad better; to hear more of his story. His life story. His God story. We sat with the sun on our shoulders as he told me of the day when his mother, father and four of his five siblings severed all ties with him because he is gay. Nine years went by. Then Tad’s father became gravely ill. The children flew from all parts of the country to be with him in his final hours. At the hospital, as everyone gathered around the father’s bed, Tad remained in the hallway, just outside the door. His sister, the only one who’d remained close to Tad, bent down and whispered in their father’s ear: Daddy, Tad is here, too. The father opened his eyes and declared to the family and to the universe: I have no son named Tad. Then he died. Tad also told me, with tears dripping off his chin, of how in high school he’d had an under-the-radar boyfriend; a secret he eventually revealed to his youth pastor in their extremely conservative church. Two years later the boy died in a motorcycle accident. After the funeral the pastor told Tad that his boyfriend’s death was God’s punishment for their wicked relationship. “Your friend died in his sin,” he’d said, “but there’s still hope for you, Tad. “Come on over,” I said. I first met Marlo several months ago on a Sunday when her 23-year-old daughter, Kelsi, introduced us after worship. Kelsi’s speech and cognitive abilities are impaired because of brain trauma she suffered as a child after falling from a tree. But Kelsi is brave, hopeful, resilient and, what’s more, last summer she collided with Jesus in a beautiful way while hanging out with other twenty-somethings from our church. Everyone else in her family is adamently non-religious. So when Kelsi started bringing up her new-found faith at the dinner table, Marlo decided to come and see for herself what snake-oil fakeries these Baptists might be peddling to her daughter. After such a poetic introduction I was happily surprised a few months later when I got the call from Marlo asking if she could come see me.